Aitken Spence Travels, Sri Lanka’s largest Destination Management Company was the only DMC in Sri Lanka to be awarded a prestigious Gold Award at the Pacific Asia Travel Association (PATA) Awards 2014 ceremony, for its innovative ecotourism concept – ‘Elpitiya Plantations Excursions’ in the Environment category. The award was presented by Susana Alexandre Ferreira Pereira de Campos Esmeriz and CEO of PATA Martin J Craigs to Nalin Jaysundera, Managing Director of Aitken Spence Travels at the Diamond Island City Hall in Cambodia’s capital, Phnom Penh. Aitken Spence Travels was identified from amongst 181 entries from 66 organisations and individuals worldwide; with awards being presented to outstanding entries in four principal categories of Marketing; Education and Training; Environment; and Heritage and Culture. 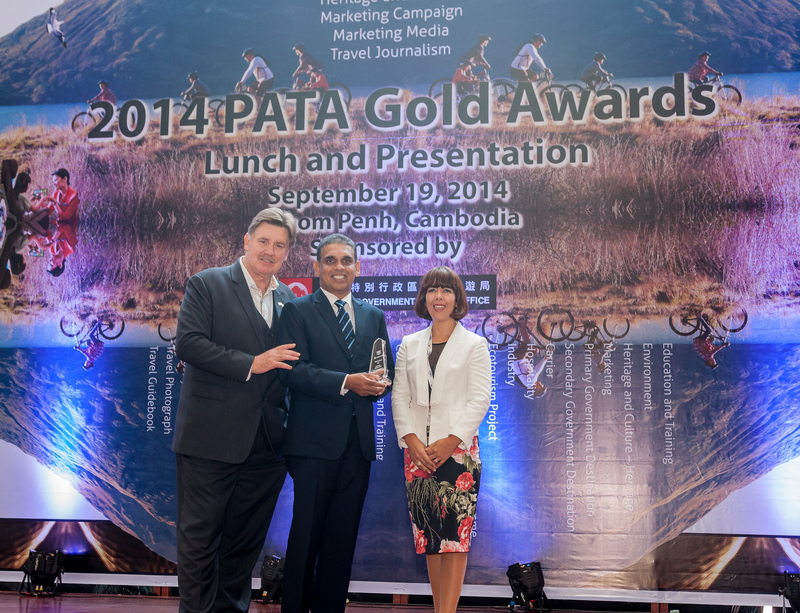 Achieving the PATA Gold award is in line with the numerous innovative sustainable service development programs continuously being introduced by Aitken Spence Travels for all its customers. The Company hopes to integrate further distinctive ecotourism projects in the future to their current diverse service portfolio. “As the only Sri Lankan Destination Management Company to receive the Gold award, we are honored and pleased to have been a recipient at PATA. Aitken Spence Travels continues to ingrain sustainable practices to all our operations and set benchmarks for the travel industry. The award will inspire us to continue with such efforts” noted Nalin Jayasundera, Managing Director of Aitken Spence Travels. The management of Elpitiya Plantations worked very closely with Aitkens Spence Travels to develop this award winning excursion to offer the traveller a memorable experience with its incorporation of activities involving local culture and environment; with the results benefiting all segments of stakeholders, due to the healthy interactions between the traveller and the locals. With a significant presence in Maldives and fully diversified in to every aspect of tourism, Aitken Spence Travels is the leader in destination management in Sri Lanka. Partnered with the world’s largest name in travel, TUI Travel Plc, and with nearly four decades of experience, the Company is backed by a reputation of being the most professional in the industry. With the commitment towards offering sustainable tourism, Aitken Spence Travels is endowed the Carbon Neutral status by the Sri Lanka Carbon Fund and maintains ISO 9001:2008 and 14001:2004 certifications. Sri Lanka’s largest Destination Management Company, Aitken Spence Travels will be presented the prestigious Gold Award at the Pacific Asia Travel Association (PATA) Awards 2014 ceremony, taking place on 19th of September, at the Diamond Island City Hall in Cambodia’s capital, Phnom Penh for its “Elpitiya Plantations Excursions” in the Environment – Ecotourism Project category. Identified from amongst 181 entries from 66 organizations and individuals worldwide, Aitken Spence Travels has been recognized for its concept on tourism innovation and excellence. PATA is a not-for profit association that is internationally acclaimed for acting as a catalyst for the responsible development of travel and tourism to, from and within the Asia Pacific region. The PATA Awards are presented to outstanding entries in four principal categories: Marketing; Education and Training; Environment; and Heritage and Culture. “We are pleased to be the recipient of this prestigious award as the only Destination Management Company in Sri Lanka for the 2014 PATA awards. Aitken Spence Travels is always thinking innovatively while placing importance on sustaining the environment that we operate in. Having developed this culture of differentiating ourselves, this award will inspire us to continue our efforts and fulfill the traveler’s needs” noted Mr. Nalin Jayasundera, Managing Director of Aitken Spence Travels. The award applauds Aitken Spence Travels for successfully transforming the inconspicuous Elpitiya town – that has originated as a result of plantation industry, to an experiential tourism destination. 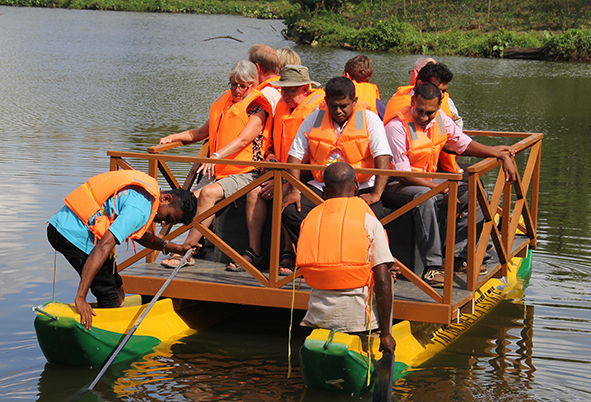 With emphasis on eco-friendly and sustainable practices, ‘Elpitiya Plantations Excursion’ is designed to offer the traveler a memorable experience with its incorporation of activities involving local culture and environment. A trek through the rubber and tea plantation with various native practices such as ‘tapping the rubber tree’ and ‘plucking tea’ contributes to the authentic experience and affirms why the outing is distinctive. The excursion benefits all segments of stakeholders involved, especially the local community, as a result of healthy interactions between the traveler and the locals. 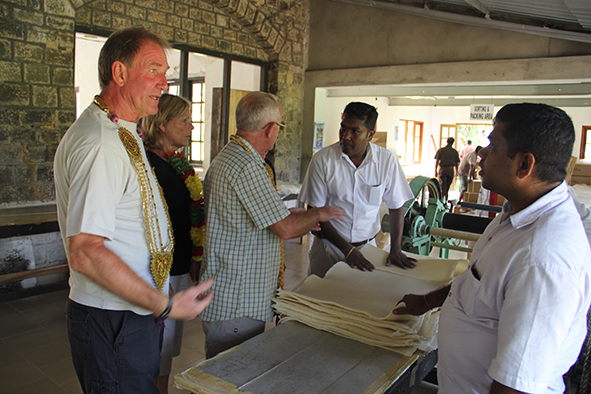 Enriching their livelihood, building strong bonds through cultural exchange of practices has allowed Aitken Spence Travels to place Elpitiya on the map for eco-tourism. With a significant presence in Maldives and fully diversified in to every aspect of tourism, Aitken Spence Travels is the leader in destination management in Sri Lanka. Partnered with the world’s largest name in travel, TUI Travel Plc, and with over third decade of experience, the company is backed by a reputation of being the most professional in the business. With the commitment towards offering sustainable tourism, Aitken Spence Travels is endowed the Carbon Neutral status by the Sri Lanka Carbon Fund and maintains ISO 9001:2008 and 14001:2004 certifications.